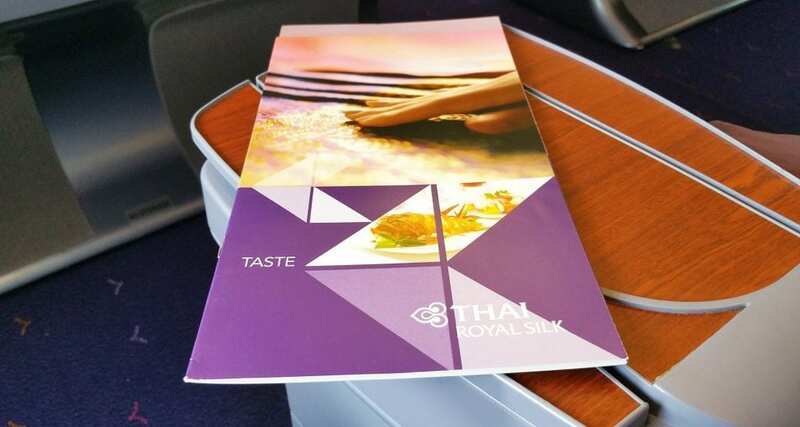 It’s time for yet another Thai Airways inflight meal review, this time we will take a look at economy and business class sectors within Asia. You can view the previous report on Thai Airways from Brussels to Bangkok right here. Back in October 2015 en-route to Australia I needed to get from Seoul to Hong Kong and decided to book this business class flight as the flight time suited me perfectly. The trip was over 3 hours, and a included a full lunch service. 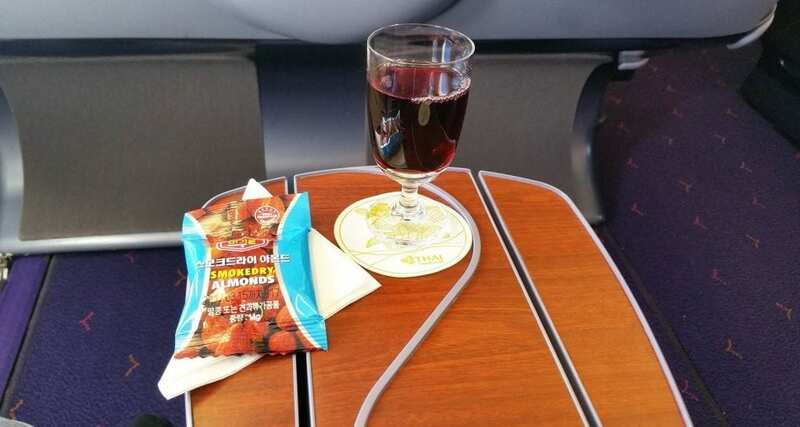 Right after take off the cabin crew distributed inflight menus and offered a drink service before the meal service. 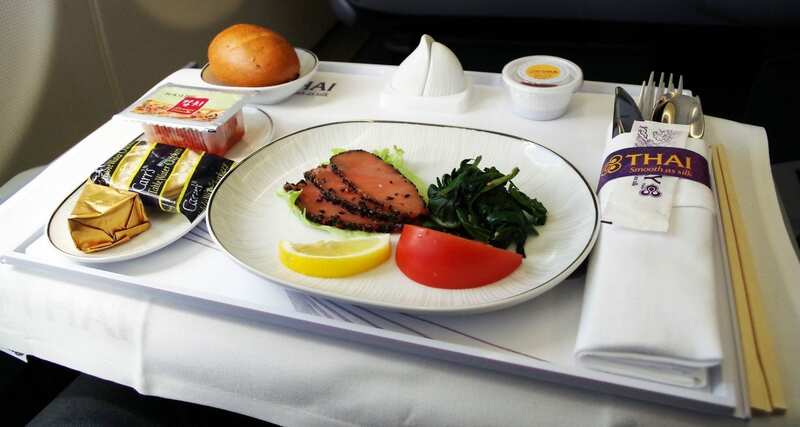 First up was the entree consisting of Roast Beef served with spinach and tomato, a side dish of pre-packaged Kimchi, cheese and crackers, and a bread roll. Up next was the main dish which consisted of: Chicken served with potato wedges, carrots and peas! 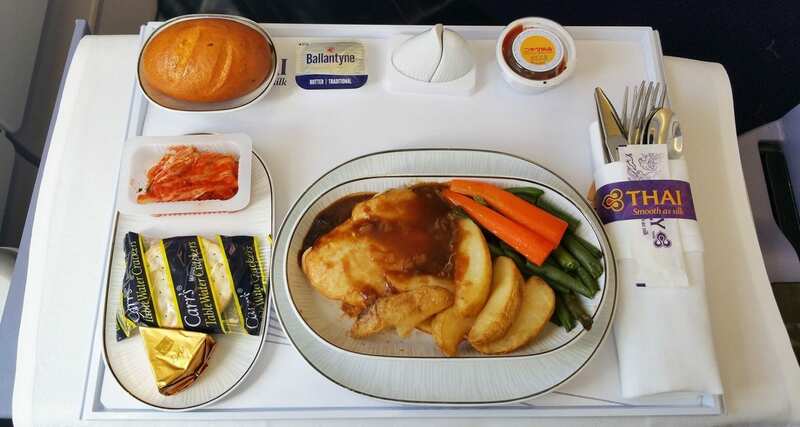 The chicken was delicious, tender and moist while the vegetables and potatoes also tasted quite good — not the best business class meal experience ever, but certainly not the worst. 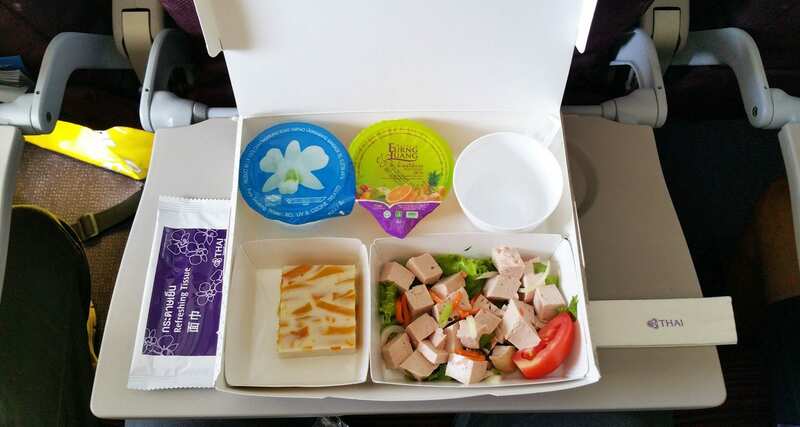 The Kimchi served could have been served fresh rather than being a prepackaged product, but there’s a reason as to why the airline chose this option. A rather simple mystery cake of some sort that was slightly dry and hardly memorable. I needed to get back to Hong Kong to connect with Xiamen Airlines and decided to book this economy class flight from Phnom Penh to Hong Kong. First up was a 55min trip from Phnom Penh to Bangkok and look at the meal that was served! Indeed a very decent amount of food on such a short flight puts a lot of European airlines to shame that’s for sure. This meal was not particularly to my liking; there was nothing wrong with it at all, it just wasn’t appealing to me. The meal was: “Moo Yor – หมูยอ” (Vietnamese sausage). Moo Yor can consist of ground pork or chicken and is mixed with black pepper then wrapped with a bunch of banana leaves, and steamed until cooked. 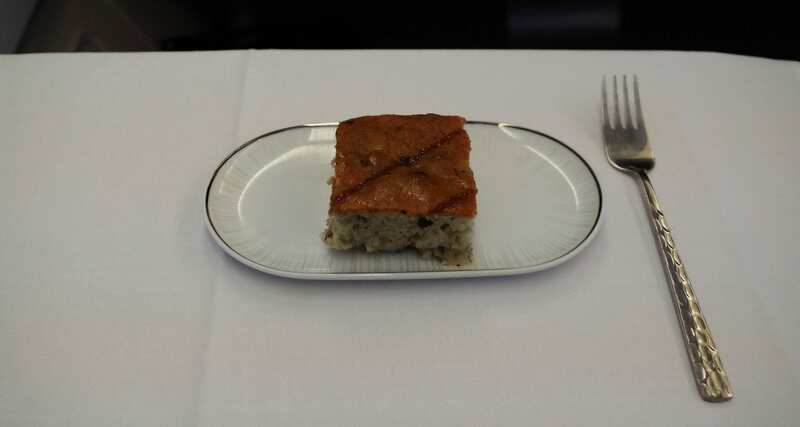 Next up was Bangkok to Hong Kong with a flight time of just over 2 hours, lunch was served on this service and consisted of: Lemon chicken with fried rice, tuna and cherry tomato salad, finished off with tiramisu. This meal was fantastic, the chicken was drenched in lemon and wasn’t dry at all, the rice wasn’t too oily, the salad was fresh, and the best part was dessert. 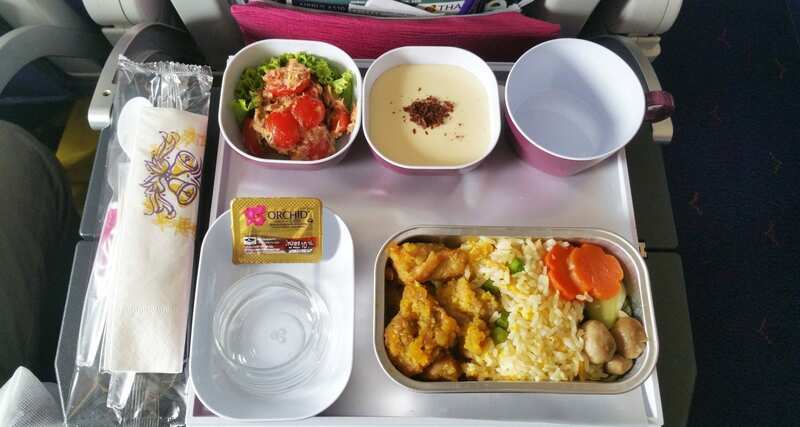 My favourite meal out of all of the above dishes sampled on various Thai Airways flights between October 2015 and January 2016!